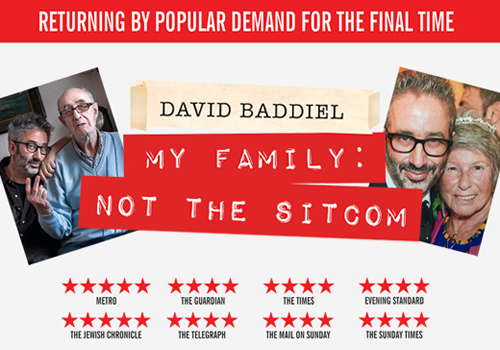 Following two hugely successful London stints at the Menier Chocolate Factory and Vaudeville Theatre, David Baddiel – My Family: Not the Sitcom returns to the West End. Opening at the Playhouse Theatre, the show is a celebration of David Baddiel’s late mother Sarah and dementia-ridden father Colin, tackling thought-provoking subjects with brutally honest humour. Covering topics such as memory, ageing, infidelity, gay cats and over-sensitive moral culture, My Family: Not the Sitcom is described by Baddiel as a massively disrespectful celebration of his parents. Because after all, when family members die, you tend to only talk about how wonderful they are. But if we truly remember our loved ones, we will remember their weirdness, madness and flaws – they may not all be angels! Baddiel has had previous success at the Menier Chocolate Factory with FAME: Not the Musical, detailing his on-off relationship with celebrity. He is perhaps best-known for his collaborations with Frank Skinner, including Fantasy Football League, which aired for over 10 years. In 2010, Baddiel wrote the hit film The Infidel, starring Omid Djalili, Matt Lucas and Miranda Hart, which later transferred to the Theatre Royal Stratford East in 2014. After an acclaimed season at the Vaudeville Theatre, My Family: Not the Sitcom opens at the Playhouse Theatre London on March 28th, running until June 3rd 2017. My Family: Not the Sitcom is recommended for those aged 16 and up, due to explicit language.